(Nanowerk News) A group of University of Tokyo researchers and their collaborators discovered a peculiar phenomenon soon after a stellar explosion known as a Type Ia supernova, using the Subaru telescope with a 8.2-meter-wide mirror operated by Japan's national astronomical observatory and located in the US state of Hawaii. They further found through analysis that this finding is the first robust evidence for one of the theories put forward to explain the physical mechanism giving rise to a Type Ia supernova explosion. The current research is the first step in understanding this mechanism, and promises to help improve the accuracy of cosmological studies employing this light source as the standard index for measuring the distance of objects in the universe. Some stars end their lives through a spectacular explosion. Astronomers believe this Type Ia supernova occurs when a star with an extremely high density, a so-called white dwarf, reaches its weight limit by increasing its mass through material gained from a companion star in a binary system, or has merged with another white dwarf in such a system in which a pair of stars bound by gravity orbit each other around a common center of mass. A similar peak brightness shared by most Type Ia supernovae allows astronomers to use it as a cosmological index for measuring the distance of objects in space. A well-known example is research using this index to demonstrate the accelerating expansion of our universe, culminating in the 2011 Nobel prize in physics. Although great strides have been made in cosmology, the mechanism of how such explosions are initiated remained a mystery. In the past few decades, astronomers have proposed various theories to explain how a white dwarf explodes, but none of them have been verified conclusively through astronomical observations. In order to find new clues to help elucidate this long-standing enigma, the research team in 2016 set out to catch Type Ia supernovae within a few days of their explosion by using the Hyper-Suprime Cam wide-field camera, the best of its kind, mounted on the Subaru telescope. In April the same year, the team led by graduate student Ji-an Jiang, Professor Mamoru Doi, and Professor Toshikazu Shigeyama of the Graduate School of Science at the University of Tokyo succeeded in detecting a light immediately following a supernova explosion, which was less than one-hundredth the peak brightness of a supernova in the Type Ia category. Moreover, observations carried out by eight telescopes around the world showed that this explosion, despite being a Type Ia supernova, is significantly different from previously observed supernovae in this class, especially in the abnormal variance in brightness seen in the first few days after the explosion. In order to confirm the origin of the peculiarities observed for this explosion, the researchers conducted numerous computational simulations based on different theoretical models. 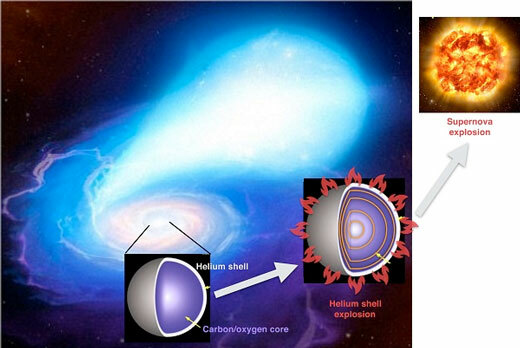 Surprisingly, they found that all the peculiar features of this particular supernova could be explained with a specific explosion model, in which the nuclear fusion of helium accumulated on the surface of the white dwarf sets off an explosive inferno, creating shock waves that travel inward to the core of the white dwarf eventually igniting a nuclear fusion of carbon?a white dwarf is thought to be composed of carbon and oxygen?finally resulting in the star's spectacular explosion. This finding (Nature, "A hybrid type Ia supernova with an early flash triggered by helium-shell detonation") is the first robust evidence indicating that one of the theoretical scenarios for a Type Ia supernova, proposed in the early 1980s, does indeed exist in our universe. "The timing of our discovery, near the emergence of the supernova, answers for the first time how the explosion of Type Ia supernovae is set off, opening the door to an essential understanding of the physical mechanism of these spectacular explosions in our universe," says Doi. He continues, "This finding also promises to bring new ideas for improving the accuracy of cosmological studies with Type Ia supernovae."